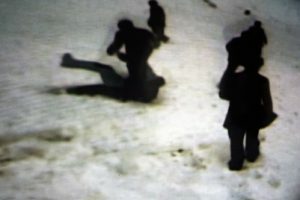 the video shows a large field covered with snow. 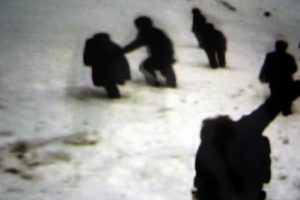 a large group of figures, faceless and in shilhouette, cross the field. at different speeds but at the same time. in the room by a five channel sound system to produce the continuity as a kind of sonic-spatial conversation. sound.the reflected video is re-shot and projected. version of perfect speed is projected on the wall opposite the frame and the re-shot projection.